taking her eggs, and her poems. – Poem by CB Follett from Visible Bones, originally appeared in Green Fuse. – Poem by CB Follett from Visible Bones, originally appeared in Verve. These are lush, moving, wonderfully accessible poems." CB Follett's Visible Bones is an astonishing book. It turns the world upside down, shakes out its contents and sorts them out bone by bone, speck of dust by speck of dust, finding its own order and meaning in the detritus. It's as if the poet is collecting shards of history and connecting them in a poetic ritual of healing – for this is a deeply healing and connecting book. This is a beautiful and luminous book of poems. CB Follett is a poet with an ear for the music of language and for the nuance of human emotions. This book is both moving and profound. Follett has a way of getting in touch with the larger world as well as the intimate world of personal relationships. I love this wonderful book. I have read, published and enjoyed individual poems of CB Follett over the years, but to hold a rich, weighty collection of them in my hands is a gift, a real gift. Apart from admiring her craft, her skill with language, her distinctive voice, there is more, much more to admire: the way she draws me in and makes me relive, rethink my own experiences. And isn’t that what poetry is all about – to make us aware, to see anew, to illuminate and intensify our own views? Every poem is full of clear, expressive imagery that flows effortlessly from one mood to another, from one vision to another. CB Follett’s wit and invention is delicious, and the emotional depth each poem possesses is often breathtaking. 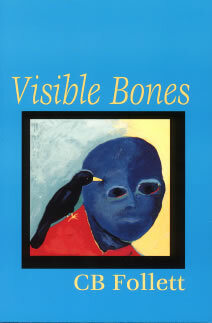 In Visible Bones, Follett looks at life with a clear unflinching eye. Her deep insight and unsentimental compassion will capture and delight the reader.